I’m going to cry today…I assure you. Fat, happy, proud tears. Last summer I started this blog and one of the first books I found on Goodreads was an unknown, self-published book called UNTEACHABLE. It had the best blurb I’d ever read and I begged an ARC off of Leah and dove in. I’m honored to have been her first review. She even gave me a shout out on her blog. I interviewed her for the UNTEACHABLE book tour. I didn’t even know what she looked like then. She’s since posted a picture on Twitter…she needn’t have waited. I was stunned by Leah’s book…it was simply amazing. Where had this girl been? Why wasn’t she famous? Who wasn’t publishing her? I couldn’t believe it. We chatted a lot last summer. I watched sales figures as MUCH BIGGER BLOGGERS got a hold of the book. It did a little business and then it did a LOT of business. I was quite sure she would be published by a traditional house within a year. Leah had different ideas. This was hardly her first rodeo and the decision to self-publish UNTEACHABLE was a hard one to make, but one she owned for a number of meaningful reasons. Based on the success of Colleen Hoover and other indie writers who have been traditionally published as of late, I was quite certain Atria was where she just MIGHT find her home. For the record, Leah laughed in my general direction when I mentioned this last summer. So, here we are, dear readers. It’s THAT day. The day I can sit here and claim no credit for, but am just about as happy as can be for it anyway. She is phenomenal, Ms. Leah Raeder. The world will know her name soon…I have no doubt. I’m stupid kinds of proud of her and still in love with her book with the rainbow-faced girl she designed for the cover once upon a time. Have you met Maise yet? No? It’s time. 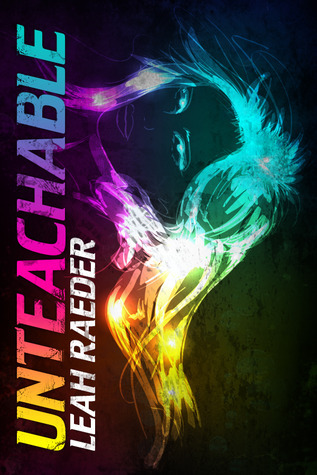 Introducing, the new UNTEACHABLE cover. It’s a great day for books. Join me in celebrating Leah’s success today.